What do the various heart line types mean? Which type of line shows if you are emotional, passionate or a bit cold-hearted? This knowledge helps people to understand each other in relationships. 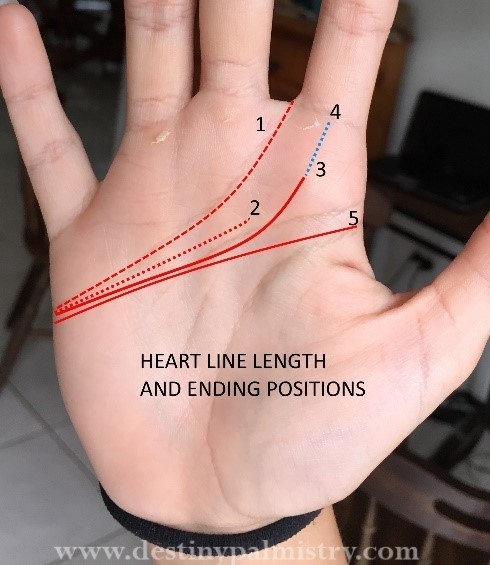 The heart line is the uppermost horizontal line beneath the fingers. A line which is clear, dark and relatively free of flaws, reveals a well-adjusted person emotionally. A line that is very marked or chained in appearance belongs to one who is restless or unstable emotionally. The more curved this line is, the more they can relate to others and the more passion there is. The shorter the line, the less empathy, and feelings are present, especially if the line is straight. An extra-long line illustrates someone who displays particularly strong feelings. A fork at the end of the heart line reveals someone who has a balanced approach in what is ideal and what is practical in relationships. THE PASSIONATE LINE. Displays feelings through action, they are passionate and know what they want. However, they can be blind to the faults of loved ones. THE FREEDOM LINE. This line shows a person who is self-focused with a love of liberty. Sombre level-headed attitude, but if it is straight, there is a lack of emotional warmth. They are not likely to be sentimental. THE IDEALIST LINE. Romantic and idealistic. They respect and admire their partner. They are also ambitious but often vain. THE CARING LINE. Others need often come first. A strong desire for connection and they are keen to express love. They may expect too much in return. THE SIMIAN LINE. Someone who can express feeling and or thought intensely. Strong character but can be obsessive and find it difficult to differentiate feeling from thought. See more about the Simian line here.